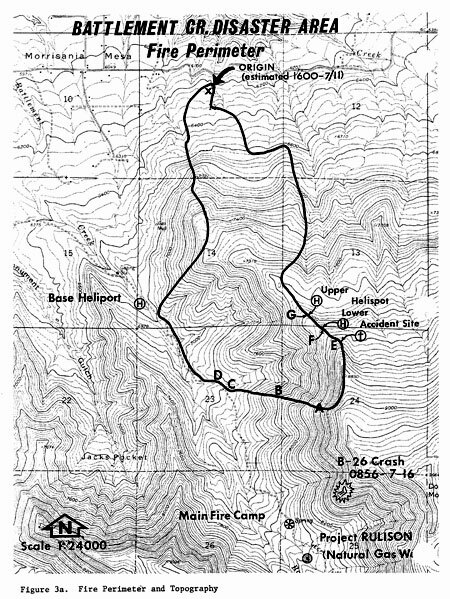 The most basic meteorological conclusion that can be drawn from available meteorological data and extensive interviews with personnel assigned on the Battlement Creek fire, Saturday, July 17, is that the accident was not directly weather related; i.e., there were no thunderstorms in the " immediate fire vicinity between 1400 and 1500 m.d.t. that could have produced downdrafts to affect the fire, no unusual or abnormal winds occurred attributable to accepted meteorological causes such as fronts, low level jet stream, or locally induced dust devils, etc. 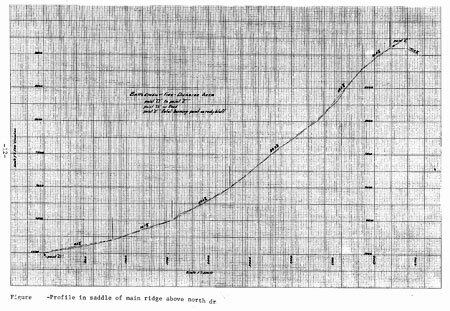 At the time of the accident, the atmosphere was unstable, normal up-slope winds were occurring, winds aloft were generally light SW and ranged from 5-15 m.p.h. from 6,600 feet to 31,000 feet m.s.l. Observers on the fire at the time of the accident reported high winds at ground level 25-35 m.p.h. and above. Earlier in the day, the weather was described as fair, winds were light both on the ridge and on lower portions of the fire. Some small whirl activity was reported about 1230-1300 m.d.t. which would indicate unstable atmospheric conditions. 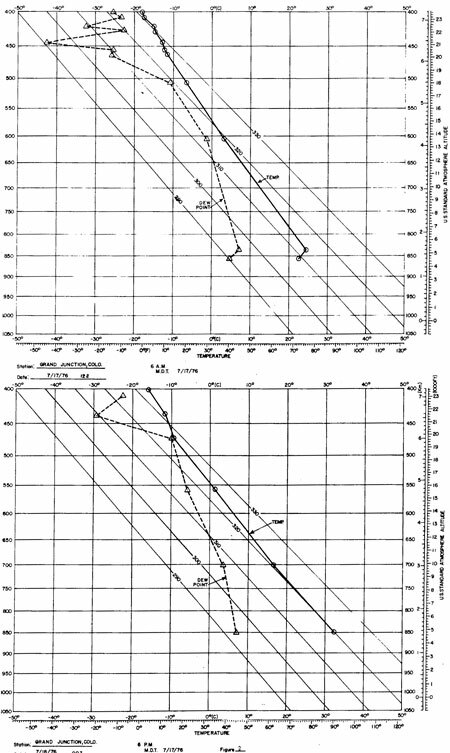 Figure 2 illustrates the morning and afternoon soundings for Grand Junction, Colorado, on Saturday, July 17, 1976. They illustrate typical summertime conditions of afternoon low-level heating and instability. Generally observers reported high winds at the time of, or just before, the accident. These were very likely local fire-induced winds generated by very intense burning and rapid rate of spread. A rather severe frost on June 14 (23-27°F. in the 6,200-9,000-foot range) produced extensive damage to Gambel's oak stands in the fire area. The frost was an important indirect weather-related event which increased the dry fuel available for combustion by killing leaves in the oak stands. Relatively warm, dry weather following the frost provided conditions conducive to drying dead plant tissue. Origin of the fire was 40 airline miles NE of Grand Junction, Colorado, and 1-1/2 miles south of the Colorado River in the Battlement Creek drainage. Battlement Creek is approximately 8 miles long and flows in a northwesterly direction to the Colorado River. The fire burned entirely on the east side of Battlement Creek (fig- 3). The topography varies from relatively level land along the drainage bottom to rugged mountain slopes. 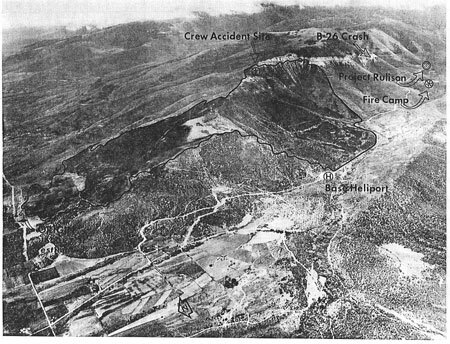 Elevations on the fire range from 6,200 feet near the origin to 8,400 feet near the site where the men died. The fire burned primarily on north-facing aspects on Thursday, July 15, and Friday morning, and on west-facing aspects on Friday afternoon and Saturday. The slopes that burned on Saturday were fully exposed to prevailing southwesterly air flow; and they received direct solar heating from 1100 on. Slopes that burned on Saturday, July 17, ranged from 10 percent above the road to 75 percent in the chute just below the ridgeline. The side drainage that burned out on Saturday was characterized by two major draws, aligned in an east-west direction. The head of the north draw was about 3,500 feet northeast of the Battlement Creek road. This draw terminated just below a saddle on the ridgeline where the Mormon Lake crew was working on Saturday. The south draw climbs in an easterly direction for 3,200 feet from the road. Side slopes of these draws were measured at 50-60 percent. Visibility to the west from the saddle above the north draw was restricted due to the topography. The slope west of the ridgetop in the saddle was gradual for about 140 feet and then broke off steeply (fig. 4). Figure 4. Profile in saddle of main ridge above north draw.